Seedling selection from Jackson County, FL, discovered in 1918 by B. W. Stone, Stone Nursery Co., Thomasville, GA. Introduced about 1925. 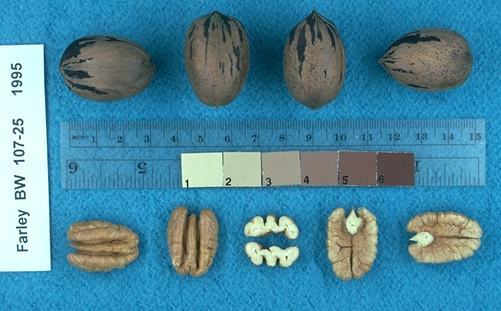 Nut; oval, with oblique (obtuse and asymmetric) to truncate apex and rounded base; cross section often distinctly 4 sided due to flattened adaxial and abaxial surfaces of nut; 60 nuts/lb, 53% kernel; kernels wrinkled in texture, with wide dorsal grooves and basal cleft. Slow to bear, low in production, late fruit maturity. Resistant to scab. Extracted from here.